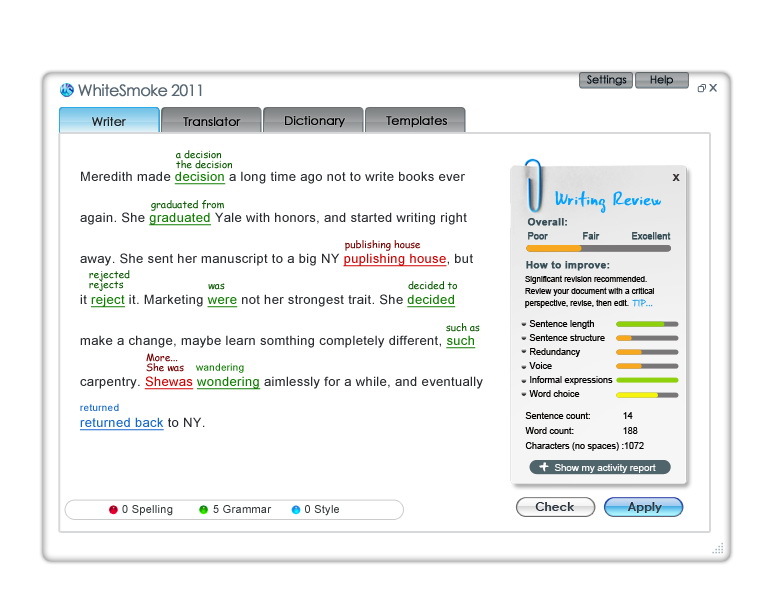 The WhiteSmoke 2011 is an all-in-one, hybrid solution for English writing, providing a convenient and easy to use writing tool that works directly from any text-based application. WhiteSmoke 2011 was available as a giveaway on September 2, 2011! Throughout the world the need for communication between countries and international business is growing and as a result, so is the need for a common language: English. WhiteSmoke 2011 involves Natural Language Processing (or NLP) and Artificial Intelligence (AI) which allows the software to “learn” the way the human mind works in the process of writing, thus going beyond providing grammatical and typographical corrections, but also improving the style, tone and clarity of your writing. The 2011 version is an all-in-one, hybrid solution for English writing, providing a convenient and easy to use writing tool that works directly from any text-based application. 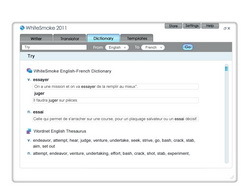 WhiteSmoke 2011 includes the a comprehensive English writing tool, full-text translator, multilingual dictionary and a multitude of ready-to-use templates. How would you improve WhiteSmoke 2011? Remove the included ToolBar, and make both the software and your web-site Malware Free. Stop bothering users with toolbars they did not ask for, and change their search settings. Get rid of the tool bar and home gage hijack - or at least uncheck it during the installation wizard. I tried to install Paragon Partition Manager 11. After I registered, I only received a login name and password. There's no Product Key or Serial Number. Can someone get this sorted for me ? For anyone encountering installation difficulties with our EXE file, please follow the instructions below. 1. Shutdown WhiteSmoke by right-clicking the WhiteSmoke icon in your system tray (bottom right of your screen, near the computer clock) > 'Shutdown WhiteSmoke'. 2. Delete all previous WhiteSmoke installation files from your computer and desktop. WhiteSmoke installation file is usually named: WhiteSmoke_Enrichment_Full.exe and you can identify it by its round light blue shape with the letters WS. 3. Go to Start > Settings > Control Panel > Click on Add/Remove Programs (Vista Users: choose "Programs and features"), choose WhiteSmoke, and click "Remove"
This will uninstall WhiteSmoke and all its components. 4. Make sure all the files in the 'WhiteSmoke' folder have been deleted, go into your C drive, open 'Program Files' and then open 'Whitesmoke'. If there are any files in this folder, please delete them. a) Go to your windows 'Start' menu, click on 'Run' and type in "regedit". Click the Okay button. 7. Restart your computer and then re-install the WhiteSmoke EXE file from GOTD. #107, Whiterabbit-uk, your licensed ID is checked on eveery operation you try as your ID is sent in the http request to their server for the action to be performed and if the ID is not listed as current or they invalidated it for some reason then you will get license expired web page returned. You would have to use a different email address on the next instalation to have any chance of a new ID being generated. What a disapointment only a 1 year license! I guess that's what you get where no core functionality is built into the program and all the processing is done on their server via plain text HTTP posts. I am disappointed that some features such as the dictionary do not work without Internet access. There is not much advantage over conventional dictionaries without this. Thank you Mags for the tip re Dicter - it is an excellent translation tool! The Journal shall own the work, including the right to produce preprints or reprints and translate into languages other than English for sale or free distribution. The software has to be improved. Please check this sentence with white smoke and see the result: The Journal shall own the work, including the right to produce preprints or reprints and translate into languages other than English for sale or free distribution. Can't get it to install/register. The pop-up that's supposed to pop up after installation - to enter email address never does... instead I get a box "your license has expired" and now way to fix. Very frustrating. Epic fail - I'm going to contact the White Smoke contact dude - will see what happens. WhiteSmoke 2011 continues to fail when I install it from Giveawayoftheday.com. I really want this this program, can you please help me the installation? I have done all the recommendation that are suggested in the error message. WhiteSmoke 2011 continues to fail when I install it. I would like to have this program for my grandkids, can you please help install. I have done all the recommendation that is displayed on the error message. If it were possible for something to be worth less than nothing, this software would qualify. As others have pointed out, this (supposedly) $250.00 piece of software isn't even the $250 version claimed, but a $99 version which is still overpriced by about $100. Installation is confusing and clunky. The registration screen was a blank white-hole that wouldn't go away until I figured out there was a place to put my email address and hit Enter. Even then, it complained that I didn't give it a name to go with the email (where was I supposed to enter it??) but it does appear to have registered. Glad I gave it at a disposable email account, as I predict, like Ashampoo, my mailbox will get inundated with "special offers **just for me*". Once registered, the program has basically no user interface. It's just a white page blocking other windows. The thing installs itself to run on every boot, but hides the fact. As others have reported, it sends your documents over the Net on an unsecured link, meaning that most people do not want to risk using it for anything other than a thank-you note to Aunt Millie. The so-called library of templates are just a few poorly-written examples that you could get from a Geocities site on how to be a better writor (sic). All in all, I see no advantage to this offering and enough potential problems and annoyances to make it worth less than the price of free (if that's possible). Certainly not the stated $250. Are they kidding??? Who would pay that for something that does so little? GAOTD, you usually come up with stuff that is at least OK for freeware, if not a real deal for a freebie. I feel that this time I am actually in the red on this deal, because of the time wasted. I've used this program for years - never taken the translator seriously - It is good for heads-up on possible gramma and spelling problems, but don't take their suggestions as being rock solid - it is a wildly overpriced piece of software - its earlier versions have set off my malaware and virus alarms at times. I also noticed that many times it would not work unless you were connected to the internet. I thought that was an excellent description and observation of this product. Thank you. Anne #83 . I thought that was an excellent description and observation of this product. Thank you. Installed after reading all the above comments on what to watch out for & after trying it I removed it. I write everything I do in MS word & their spell & grammar checker is much better than what they offer. The software also tried to change my home page even though I said not to but my SuperAntiSpyware stopped the software from changing it. I would NOT recommend this software to anyone other than my enemies! Of course I uninstalled it! The only reason why they are successful is because they pay their affiliates 50% of the price & we all know how many marketing gurus are out there are just cash whores & could care less about the buyer other than their money. I think they are trying to blow white smoke up our *sses!! Installed after reading all the above comments on what to watch out for &amp; after trying it I removed it. I write everything I do in MS word &amp; their spell &amp; grammar checker is much better than what they offer. The software also tried to change my home page even though I said not to but my SuperAntiSpyware stopped the software from changing it. I would NOT recommend this software to anyone other than my enemies! Of course I uninstalled it! The only reason why they are successful is because they pay their affiliates 50% of the price &amp; we all know how many marketing gurus are out there are just cash whores &amp; could care less about the buyer other than their money. I think they are trying to blow white smoke up our *sses!! please download the installation file again. Before downloading please make sure to clear your browser cache and cookies. Dear users, When an error occurs during the installation process, please download the installation file again. Before downloading please make sure to clear your browser cache and cookies. WS support. Your homepage was not technically "hijacked" - You agreed to it. If you are upset about the toolbar and homepage change, not to be rude, but it is your own fault for NOT READING THE INSTALLER. As a student developer and as a consumer I do not agree with the actions of setting it as the default, and believe that if such an option is to be added, it should be secondary and off by default. Studies have shown that people just fly through the standard "Next, Next, Next, Finish" installers, and do not read them. You will save yourself a lot of trouble of having to sort though upset comments about the homepage change and the toolbar if they are included but not defaulted. For me, the best looking installers were either all disselected by default (pure optional choices), or having default options for Desktop Icons and Quick-launch Icons selected, and having toolbars & homepages disselected by default. End users cannot agree to this as they are not entering into a financial contract with you, thereby making the use of today's giveaway technically illegal. Section 3.1 of your license agreement states: <cite>3.1 This Agreement is effective upon your consummation of the transaction for the purchase of the license for the Software, following your payment of the applicable license fees. End users cannot agree to this as they are not entering into a financial contract with you, thereby making the use of today's giveaway technically illegal. The program was surprisingly small. Resource impact is acceptable for me, being about 40MB while running. I did use my real email, because I have control over my domain's spam filters... I am not sure though about the previous comment(s) about spam because I have not received any messages from the company. One thing that did annoy me was that the program said "enter your email to have your registration key sent to you" and then when submitting that it auto-registered itself... If you are going to lie to me about sending me the email for it to be registered and just have it auto-register, you shouldn't ask in the first place IMO. Overall, I do see some downsides to this product, but in the end I like it and find it useful. "In the clouds there is no privacy!" Be careful with your texts because "In the clouds there is no privacy!" At least, the developers should come here to explain about the installing, and activation problems... and of course, fix those problems. I have seen a lot of small size companies here, that when the users had problems installing of activating the software, they were here from morning to evening trying to fix issues, explaining the problems, and listening to users feedback, caring for what they think about the program, what they think about the problems, installation, compatibly, issues and everything. Putting software here is not only to get a bigger marketshare, its also to see and learn what you can do better relating to the software you sell or want to sell (with improvements) in the future. At least, the developers should come here to explain about the installing, and activation problems... and of course, fix those problems. I have seen a lot of small size companies here, that when the users had problems installing of activating the software, they were here from morning to evening trying to fix issues, explaining the problems, and listening to users feedback, caring for what they think about the program, what they think about the problems, installation, compatibly, issues and everything. Putting software here is not only to get a bigger marketshare, its also to see and learn what you can do better relating to the software you sell or want to sell (with improvements) in the future. Running the introductory blurb from the French GAOTD page through Google translate, you end up with the exact same intro atop this page (in less than a second). WhiteSmoke 2011 enhances the natural language processing (NLP) and Artificial Intelligence (AI) that allows the software to "learn" how the human mind works in the process of writing, thus going beyond the provision of grammatical and typographical corrections, and also improving the style, tone and clarity of your writing. The 2011 version is a hybrid all-in-one for writing in English, providing a convenient tool for writing and easy to use that works directly from any application based on the text. WhiteSmoke 2011 includes a comprehensive tool for writing English, a translator of the complete text, a multilingual dictionary and a multitude of models ready for use." Whitesmoke 2011 improves the treatment of natural languages and the artificial intelligence that allows the software to learn how the human spirit is in the process of writing, undercutting the – beyond the provision of corrections grammaticales and typographiques and improving the style, the tone and the clarity of your writing. The 2011 is a hybrid all – in – 1 for the writing of the English, providing a tool of essay dresser and easy to use that works directly from any application is based on the text. Whitesmoke 2011 includes a tool of drafting an understanding, a translator of full text, a dictionary plurilingue and a host of models ready to use." Compare the two and decide which you prefer. re Steve @ No 81 - Posting a comment with its middle missing wan't all that useful. So... Running the introductory blurb from the French GAOTD page through Google translate, you end up with the exact same intro atop this page (in less than a second). "The need for communication between countries and international trade grows around the world, and consequently, the need for a common language: English. WhiteSmoke 2011 enhances the natural language processing (NLP) and Artificial Intelligence (AI) that allows the software to "learn" how the human mind works in the process of writing, thus going beyond the provision of grammatical and typographical corrections, and also improving the style, tone and clarity of your writing. The 2011 version is a hybrid all-in-one for writing in English, providing a convenient tool for writing and easy to use that works directly from any application based on the text. WhiteSmoke 2011 includes a comprehensive tool for writing English, a translator of the complete text, a multilingual dictionary and a multitude of models ready for use." More than fifty seconds after runnibg the same thing through WhiteSmoke, what you get is "The need of communication between the countries and the international trade grows around the world, and as a result, the need for a common language: The English. Whitesmoke 2011 improves the treatment of natural languages and the artificial intelligence that allows the software to learn how the human spirit is in the process of writing, undercutting the – beyond the provision of corrections grammaticales and typographiques and improving the style, the tone and the clarity of your writing. The 2011 is a hybrid all – in – 1 for the writing of the English, providing a tool of essay dresser and easy to use that works directly from any application is based on the text. Whitesmoke 2011 includes a tool of drafting an understanding, a translator of full text, a dictionary plurilingue and a host of models ready to use." Compare the two and decide which you prefer. I had WhiteSmoke a few years back and was surprised when I saw it here. Tried to install it and it came up "current license expired" and no matter what I do I can't get it to install to where I don't get that message and where I can use the product. Thanks GAOTD for bringing us free software daily(some good,some bad). Perusing today's comments I would suggest a rethink about including WHITESMOKE software in future offerings until such time as they improve their reputation. Such software as todays offering tends to tarnish GAOTD's track record of quality programs brought to us at no cost. Anyway thanks again GAOTD for the attempt, please continue. Not sure what all the fuss is about. I installed WS on a Win 7-64 and Win XP-SP3 system. Bot installed without too much trouble. During the installation on both my Comodo did go a little nuts and maybe should have turned Comodo off. On the Win 7 system the installation did hang on the final step, but I suspect it was due to Comodo. Extracting the file to C:\ does seem archaic for sure, but it did work. Furthermore, going with the Custom install and unchecking the toolbar and email notification section as mentioned previously made things easier. As noted in other posts a System Restore point is a good idea. The software itself is interesting, and I think it will add to my pitiful attempts at writing. Overall it's a plus. Thanks GOTD. #39: "... it is possible to disable the Start with Windows option. Just right-click on the tray icon, select Shutdown WhiteSmoke, and untick the option “Load WhiteSmoke on Startup”." Didn't work -- shortcut still in the Start Menu -> Startup folder. #45: "Libre Office is 189mb !! WAY too many megabytes for me!! Why can’t they offer just the word processor instead of having to download the whole dang office suite?" If you can manage the download, poetableapps.com has a portable version setup -- run it entirely off a USB stick if/when space is a problem. #77: "The “cannot run as it is not configured correctly” error message is shown when you don’t have .NET Framework 2.0 installed. Unfortunately the installer does not check for this vital requirement." FWIW Process Explorer showed WhiteSmoke using Internet Explorer & Flash, but not .NET during testing. Just double checked & no .NET files/processes reported. #79: "... can’t seem to get this installed, have tried three times. Each time it hangs on a white popup with a gray frame that says, “Preparing Whitesmoke 2011 for first time to use…”, and a ‘spinning’ icon that just keeps going. As I post this, it’s still spinning 15 minutes straight. " Maybe check your Flash installation & version? You might also try visiting a page with Flash in your browser, right clicking the Flash object, & selecting settings, perhaps turning hardware acceleration off? #39: <em>"... it is possible to disable the Start with Windows option. Just right-click on the tray icon, select Shutdown WhiteSmoke, and untick the option “Load WhiteSmoke on Startup”. "</em> Didn't work -- shortcut still in the Start Menu -&gt; Startup folder. * * * #45: <em>"Libre Office is 189mb !! WAY too many megabytes for me!! Why can’t they offer just the word processor instead of having to download the whole dang office suite? "</em> If you can manage the download, poetableapps.com has a portable version setup -- run it entirely off a USB stick if/when space is a problem. * * * #77: <em>"The “cannot run as it is not configured correctly” error message is shown when you don’t have .NET Framework 2.0 installed. Unfortunately the installer does not check for this vital requirement. "</em> FWIW Process Explorer showed WhiteSmoke using Internet Explorer &amp; Flash, but not .NET during testing. Just double checked &amp; no .NET files/processes reported. * * * #79: <em>"... can’t seem to get this installed, have tried three times. Each time it hangs on a white popup with a gray frame that says, “Preparing Whitesmoke 2011 for first time to use…”, and a ‘spinning’ icon that just keeps going. As I post this, it’s still spinning 15 minutes straight. "</em> Maybe check your Flash installation &amp; version? You might also try visiting a page with Flash in your browser, right clicking the Flash object, &amp; selecting settings, perhaps turning hardware acceleration off? Also, does anyone know with certanty which version this is? The shown price is for the Exec version which I think is supposed to include all the other versions, but it sounds like that may not be the right one? WhiteSmoke is primarily a spell checker that works in whatever text box you have open -- select text & press F2. I does have a Translation feature, but in tests it would only translate the first 1.5 lines or so. How accurate it is compared to something like Google Translate I have no idea, but it does give you the option to send your text to onehourtranslation.com . WhiteSmoke does offer some Grammar correction, but IMHO it didn't compare to what I've seen in Word Processors, & many of the comments/suggestions made either didn't make sense to me, weren't 100% proper, or were poorly styled. Finally there are several form Templates included that are are actually Form Letters where you fill in the blanks, e.g. "Dear _____," . WhiteSmoke uses hooks to intercept what you're doing so it knows to open & copy selected text when you press F2 -- AV software may object. WhiteSmoke also includes "ComVistaElevator.dll" which may be another AV trigger -- Google hits include reports of malware. Security Manager 2010 for Microsoft Outlook is also included [e.g. osmax.ocx], which is designed to suppress several warning messages. Together those 2 components account for most of the nearly 900 new registry entries recorded. It also relies on Internet Explorer & Flash. The GOTD WhiteSmoke2011.zip [md5 = 8964890c24422adc373a11f693c0619b ] expands to the usual Setup.exe & readme.txt. Running Setup.exe opens a WinRAR self extractor, once it calls home to verify the date, that gives you the actual WhiteSmoke.exe file, just 146 KB -- before extracting the file browse to the folder where you want it. Running WhiteSmoke.exe downloads & installs the needed program files, when it's done opening a page in your web browser & showing a window with space for your e-mail address -- clicking the button after entering your address activates/registers the software... while I didn't see an About box, clicking the Start Menu shortcut "WhiteSmoke registration" brought up a small message window that it was already registered. During install you're given the option to add the Clarity Seek Service/Toolbar, which adds 2 folders to Program Files\ & a recorded 39 new registry entries [clarityseek.com]. The "WhiteSmoke" program folder holds 799 files, 95 folders, ~17 MB, plus a "WhiteSmoke" folder is added to User App/Application Data. WhiteSmoke is primarily a spell checker that works in whatever text box you have open -- select text &amp; press F2. I does have a Translation feature, but in tests it would only translate the first 1.5 lines or so. How accurate it is compared to something like Google Translate I have no idea, but it does give you the option to send your text to onehourtranslation.com . WhiteSmoke does offer some Grammar correction, but IMHO it didn't compare to what I've seen in Word Processors, &amp; many of the comments/suggestions made either didn't make sense to me, weren't 100% proper, or were poorly styled. Finally there are several form Templates included that are are actually Form Letters where you fill in the blanks, e.g. "Dear _____," . WhiteSmoke uses hooks to intercept what you're doing so it knows to open &amp; copy selected text when you press F2 -- AV software may object. WhiteSmoke also includes "ComVistaElevator.dll" which may be another AV trigger -- Google hits include reports of malware. Security Manager 2010 for Microsoft Outlook is also included [e.g. osmax.ocx], which is designed to suppress several warning messages. Together those 2 components account for most of the nearly 900 new registry entries recorded. It also relies on Internet Explorer &amp; Flash. The GOTD WhiteSmoke2011.zip [md5 = 8964890c24422adc373a11f693c0619b ] expands to the usual Setup.exe &amp; readme.txt. Running Setup.exe opens a WinRAR self extractor, once it calls home to verify the date, that gives you the actual WhiteSmoke.exe file, just 146 KB -- before extracting the file browse to the folder where you want it. Running WhiteSmoke.exe downloads &amp; installs the needed program files, when it's done opening a page in your web browser &amp; showing a window with space for your e-mail address -- clicking the button after entering your address activates/registers the software... while I didn't see an About box, clicking the Start Menu shortcut "WhiteSmoke registration" brought up a small message window that it was already registered. During install you're given the option to add the Clarity Seek Service/Toolbar, which adds 2 folders to Program Files\ &amp; a recorded 39 new registry entries [clarityseek.com]. 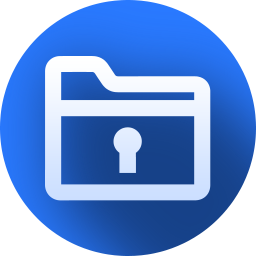 The "WhiteSmoke" program folder holds 799 files, 95 folders, ~17 MB, plus a "WhiteSmoke" folder is added to User App/Application Data. I was talking about downloading ONLY the word processor not the entire suite and then "picking from the suite". Libra doesn't offer downloading ONLY the word processor, you have to download all 189 mb first. Thank you though for the suggestion. @ no. 69... I was talking about downloading ONLY the word processor not the entire suite and then "picking from the suite". Libra doesn't offer downloading ONLY the word processor, you have to download all 189 mb first. Thank you though for the suggestion. Finally I could wipe out Whitesmoke from my computer after a hard time work. Thanks #51 rroberto for your advice. I can't believe that in more than 73 reviews only three or four got infected or at least use antivirus and antimalware programs!!! I restored my system and I'm here again to thank for your advice. I'm a fan of GAOTD but today I think I've found that nobody in the team run the program on their own machines!!! Thanx # 49 and 50 I think we suffered the same problem!!! I've always heard such good things about this software! A shame it doesn't really live up to those promises; not at its current < $200 price tag. I decided to try out the translation bit, and noticed that it doesn't capitalize ANY of the translation. If I translate "I have a kitten. Perhaps I should pet it." into "ich habe ein kätzchen . vielleicht sollte ich haustier ." As you can see, none of the nouns (I/Ich, cat/Kätzchen) are capitalized, and it's gone and added a space before each period. I don't know what database it's pulling the translations from, but it isn't very good at all! The grammar checker also doesn't recognize "or else" as a single clause. In the statement "I have a kitten. Perhaps, I should pet it. Or else maybe I shouldn't pet it." it suggested that 'Or' was bad grammar. The replacement "I have a kitten. Perhaps, I should pet it. On the other hand, else maybe I shouldn't pet it." is considered 'excellent' grammar. Right-clicking on any word offers, among other things, a thesaurus and dictionary. The word "perhaps" has the definition of: "Perhaps: dfdfdfadverbmeme possibly: dfdfdfPerhaps it will rainmeme". Not all of the definitions have "dfdfdf' and "meme" in them, but there are several that do. I will probably keep the software as something amusing, but I expected much, much, MUCH better from something that costs more than $200. I've always heard such good things about this software! A shame it doesn't really live up to those promises; not at its current &lt; $200 price tag. I decided to try out the translation bit, and noticed that it doesn&#039;t capitalize ANY of the translation. If I translate &quot;I have a kitten. Perhaps I should pet it.&quot; into &quot;ich habe ein kätzchen . vielleicht sollte ich haustier .&quot; As you can see, none of the nouns (I/Ich, cat/Kätzchen) are capitalized, and it&#039;s gone and added a space before each period. I don&#039;t know what database it&#039;s pulling the translations from, but it isn&#039;t very good at all! The grammar checker also doesn&#039;t recognize &quot;or else&quot; as a single clause. In the statement &quot;I have a kitten. Perhaps, I should pet it. Or else maybe I shouldn&#039;t pet it.&quot; it suggested that &#039;Or&#039; was bad grammar. The replacement &quot;I have a kitten. Perhaps, I should pet it. On the other hand, else maybe I shouldn&#039;t pet it.&quot; is considered &#039;excellent&#039; grammar. Right-clicking on any word offers, among other things, a thesaurus and dictionary. The word &quot;perhaps&quot; has the definition of: &quot;Perhaps: dfdfdfadverbmeme possibly: dfdfdfPerhaps it will rainmeme&quot;. Not all of the definitions have &quot;dfdfdf&#039; and &quot;meme&quot; in them, but there are several that do. I will probably keep the software as something amusing, but I expected much, much, MUCH better from something that costs more than $200. I'm not giving this a thumbs down, as I believe many others who haven't tried this software have done, but there are many reasons I wouldn't risk trying this software. 1. Has a poor WOT rating. 3. I normally laugh at comments on poor English on websites. After all I want software designed by competent programmers, not English scholars, but int the case of software to correct grammar, this is an indication of the weakness of the software which was likely used in checking the grammar of their copy. 4. Someone mentioned that White Smoke is well known software. Yes it's true, but often in a negative light. I'm not giving this a thumbs down, as I believe many others who haven't tried this software have done, but there are many reasons I wouldn't risk trying this software. 1. Has a poor WOT rating. 2. Many malware warnings reported on this page (False positives are a possibility, but the frequency malware reports seems to indicate a real threat.) 3. I normally laugh at comments on poor English on websites. After all I want software designed by competent programmers, not English scholars, but int the case of software to correct grammar, this is an indication of the weakness of the software which was likely used in checking the grammar of their copy. 4. Someone mentioned that White Smoke is well known software. Yes it's true, but often in a negative light. Whitesmoke 2011 improves the treatment of natural languages and the artificial intelligence that allows the software to learn how the human spirit is in the process of writing, undercutting the - beyond the provision of corrections grammaticales and typographiques and improving the style, the tone and the clarity of your writing. The 2011 is a hybrid all - in - 1 for the writing of the English, providing a tool of essay dresser and easy to use that works directly from any application is based on the text. Whitesmoke 2011 includes a tool of drafting an understanding, a translator of full text, a dictionary plurilingue and a host of models ready to use. I think that nicely sums up the relative value of the program. Not being an 'essay dresser', I shall now be uninstalling. Visiting the French GAOTD page I cut and pasted the intro text for Whitesmoke into (a) Google translate (French auto-detected, translation 50 seconds on a 6 core CPU) The need of communication between the countries and the international trade grows around the world, and as a result, the need for a common language: The English. Whitesmoke 2011 improves the treatment of natural languages and the artificial intelligence that allows the software to learn how the human spirit is in the process of writing, undercutting the - beyond the provision of corrections grammaticales and typographiques and improving the style, the tone and the clarity of your writing. The 2011 is a hybrid all - in - 1 for the writing of the English, providing a tool of essay dresser and easy to use that works directly from any application is based on the text. Whitesmoke 2011 includes a tool of drafting an understanding, a translator of full text, a dictionary plurilingue and a host of models ready to use. I think that nicely sums up the relative value of the program. Not being an 'essay dresser', I shall now be uninstalling. can't seem to get this installed, have tried three times. Each time it hangs on a white popup with a gray frame that says, "Preparing Whitesmoke 2011 for first time to use...", and a 'spinning' icon that just keeps going. As I post this, it's still spinning 15 minutes straight. Either something is wrong with the installer, or my second guess involves my use of the mvps hosts file which blocks malware sites.... the installer is perhaps attempting to contact a site as part of the install that mvps hosts has blocked??? Anyway, this is a disappointment, and certainly not working or installable. If you need me to contact mvps blocked sites to install your adware, then this probably is not the software for me (or anyone else!). Froze my computer when trying to instal - had to turn it off - did the same when I restarted. Will have to remove. @Upset (#55): The "cannot run as it is not configured correctly" error message is shown when you don't have .NET Framework 2.0 installed. Unfortunately the installer does not check for this vital requirement. To avoid problems when installing and later use custom install, untick install Whitesmoke toolbar, ensure you untick any communications boxes and use a 'valid' email address, note that this is not the same as a 'real' email address. The most expensive program ever if judged by the ratio price per Mb !!! $250 for a little over 1 Mb. Astonishing ! Fails to install (correctly). I have installed it 4 times and re-downloaded it each time, and restarted the computer each time. The extracted REAL installer is 149,328 bytes (rather small!). Running this and everything "appears" to work, the installer downloads (way to fast) the software and installs it (don't bother keeping the installer, its actually just a loader). Once the installer places the menu icons, desktop icon and quick launch icon, it exits, without any message. Starting WhiteSmoke (even the registration application) results in the error message: "This application has failed to start because the application configuration is incorrect. Reinstalling the application may fix this problem.". How often do I need to install it before the configuration will be correct? I have used WhiteSmoke in the past, even bought it once, but their licensing leaves something to be 'desired'. If you reinstall (new computer or reinstalled the OS) the license is no longer valid and they want you to purchase a new license; at full cost! Considering my previous experience with this company, and the fact that this version fails to even install (correctly), use at your own risk and be happy you got it for free, but be forewarned though, if you buy it, you may not actually be able use it. Note to publisher, OS is fresh installed Windows XP with SP3 and all updates currently available from Microsoft. System is an Intel 3.20GHz, with 1GB RAM. Background task running, Explorer and Antivirus. No reason it should fail to run. Fails to install (correctly). I have installed it 4 times and re-downloaded it each time, and restarted the computer each time. The extracted REAL installer is 149,328 bytes (rather small!). Running this and everything "appears" to work, the installer downloads (way to fast) the software and installs it (don't bother keeping the installer, its actually just a loader). Once the installer places the menu icons, desktop icon and quick launch icon, it exits, without any message. Starting WhiteSmoke (even the registration application) results in the error message: "This application has failed to start because the application configuration is incorrect. Reinstalling the application may fix this problem.". How often do I need to install it before the configuration will be correct? I have used WhiteSmoke in the past, even bought it once, but their licensing leaves something to be 'desired'. If you reinstall (new computer or reinstalled the OS) the license is no longer valid and they want you to purchase a new license; at full cost! Considering my previous experience with this company, and the fact that this version fails to even install (correctly), use at your own risk and be happy you got it for free, but be forewarned though, if you buy it, you may not actually be able use it. Note to publisher, OS is fresh installed Windows XP with SP3 and all updates currently available from Microsoft. System is an Intel 3.20GHz, with 1GB RAM. Background task running, Explorer and Antivirus. No reason it should fail to run. Biggest problem with Google translate is their Czech to English traslations, or it could be that Czechs write very badly! I recommend today's giveaway to all Czechs, to help them improve their writing! Biggest problem with Google translate is their Czech to English traslations, or it could be that Czechs write very badly! I recommend today's giveaway to all Czechs, to help them improve their writing! It not requires 64bit processor. I have AMD Duron 1.8GHz and windows XP Professional SP2 - program work properly. #45 I just downloaded Libre Office to check it out. You can download only the writer. Do custom install and pull down menu on each item asking to install. Click do not install on each that you don't want. As an IT professional the three times I have seen the White Smoke toolbar were on throughly infected systems - ie TDSS rootkits. Malwarebytes also flags their software as spyware or worse. I am dismayed that GOTD would allow any software made available through them to contain any adware, spyware, or even offers for toolbars, etc. It's supposed to be commercial grade software from nascent but reputable software developers available for free as a promotional item. If GOTD is going to post garbage-ware it's reputation will be permanently tarnished and not going to last very long after word gets around. I hope to see more stringent standards applied and better quality of applications appear in the very near future. We don't need your thought control! Free alternative: http://afterthedeadline.com/ Google Chrome & Firefox add-ons. I've not tried it yet. Simply came across it looking for addons, and thought it was relevant to the GOTD. Free alternative: http://afterthedeadline.com/ Google Chrome &amp; Firefox add-ons. I've not tried it yet. Simply came across it looking for addons, and thought it was relevant to the GOTD. @promytius (#60) that does NOT make adding malware/toolbars okay.